With adventures beginning from your choice of Siem Reap (16 days) or Phnom Penh (12 days), and finishing in Saigon, Vietnam, you can truly explore and uncover the mysteries of these two incredible countries. The donation part is not mandatory, but it is an expectation. We want people to be open to the idea of supporting one or more of the NGOs we visit and learn about. If, after meeting some of the local teams and learning about their programs, the riders did not want to donate, then they are not required to. We understand how important it is to take rest in a place that’s clean and comfortable – especially after a hard slog on the bikes. That’s why we always make an effort to get you settled in somewhere in town suited to that description. Where we can, we will organise boutique style accommodation for everyone (with a pool) because quite frankly, you deserve it. We’ll also make sure that a massage is not far away! In Ben Tre in the midst of the Mekong Delta, we stay with a local family in a homestay setting. This is a great chance to pick up a few cooking skills! There are times where the accommodation may change, but generally speaking, we stay at the following hotels: Tanei Boutique Villa in Siem Reap, Holiday Hotel in Battambang, KM Hotel in Pursat, Mito Hotel in Phnom Penh, Dai Luong in Rach Gia, Ninh Kieu in Can Tho and Tripwriter in Saigon. You’ve probably heard it said a dozen times already, but you’ll find some of the friendliest people on the planet in Cambodia and the same stands true for Hoem; our translator/guide/driver and all round great guy. Hoem has been with us from our very first tour and gives testament to the value of local knowledge. And of course, Brett Seychell, the Social Cycles founder does not miss an opportunity to get back on the bike and cycle through his favourite part of the world. Cycling Cambodia is the inspiration for what has become Social Cycles. ‘So’ (that’s his name, pictured right) is an absolute superstar and will take care of everything bike related. Buntry (has his own picture) is the newest member of the team and travels all the way from Siem Reap to Saigon. Once we cross the border into Vietnam, we’ll meet up with the Social cycles Vietnam crew who will guide us all the way to Saigon along with Buntry! The best part about cycling from one country to another is to cycle through the various regions of food along the way. This is slow travel at it’s best as Cambodia offers salt lakes and pepper farms, fresh crab markets in Kep and tarantulas in Phnom Penh (optional!) Meanwhile, in the Mekong Delta, you will roll your own noodle sheets and eat your way through a street food degustation sensation of everything sweet, salty, spicy and sour! Most of the included dinners are at social enterprise based restaurants, supporting the local NGOs. But this is not the main reason we eat here, it’s because the food is delicious! All meals are shared, ‘family style’, so you get an abundance of choice sitting in front of you at the table. A great chance to try a bit of everything! Dietaries are catered for as well, just let us know in advance. In Cambodia and Vietnam, we use 24 speed mountain bikes. Most bikes have either 27″ or 29″ wheels, whilst some of the smaller bikes are 26″. The front suspension is perfect for the bumps along the road and the wider tyres allow for strong traction when you need it most. You’re welcome to bring your own saddle if you’re slightly nervous about getting a bit sore, or haven’t had the chance to get a lot of saddle time before the ride. Another good option is to bring along a gel seat (cushion). The bikes are fitted with standard pedals. Again, you’re welcome to bring clip ins should you want them. All bikes are fitted with a water cage. Bikes re fully serviced before and after every ride and we’ll have So, our trusty mechanic, with us at all times! Some days are 30km, some are 50km and some are a little further. See itinerary for daily details. When we embark on an 85km day, the distance can seem quite daunting. However, an early start for 7am and an ETA of 4pm arrival gives us 9 hours to get there. And two hours of extra daylight up our sleeve if we need it! Travelling by bicycle is not about the destination, but the journey. We’ll stop for Khmer and Vietnamese coffees, local treats, lunch and of course, to take plenty of pictures. When we are moving, the average pace is about 15-20km per hour. Our small group policy means it’s easier for all of us to stay together. You don’t need to be super fit for this ride, you just need to be positive. At times, there may be an opportunity to continue cycling and push 100km in a day. It doesn’t mean you have to, but if time is on our side, the path is beautiful and you’re feeling fit, then you have the option. The alternative is to get in the air conditioned van, shuttle off to the hotel and enjoy a cold beer! It’s win-win! We take a minimum of two riders and a maximum of 12. We strongly believe that when you travel with a group beyond 12, there is a risk that voices and opinions may be drowned out when we have the rare opportunities to visit NGOs and ask questions to local leaders. The Siem Reap to Saigon ride also comprises of smaller travel opportunities (Siem Reap to Phnom Penh or Phnom Penh to Saigon for example), therefore, there may be more than 12 people in it’s entirety, but not at any one time. If you’d like to book a private tour with you and your friends, simply click here for more information. We can also explore self guided tours in this region. Friends International are leading the charge in the ‘ChildSafe’ movement and the ‘Think Families, Not Orphanages’ campaign. Friends International have an office in Phnom Penh, which makes for a great introduction to Cambodia. Chumkriel Language School is an incredible organisation that go so far beyond teaching language. In Vietnam, we often visit Mekong Plus, a fantastic organisation that work within community development with a very holistic approach. In Siem Reap, we often get a chance to learn from This Life Cambodia. In the small’ish regional province of Pursat, we’ll visit and learn from Sustainable Cambodia about their community development and educational programs. Due to the nature of travel, public holidays and unavoidable timetable clashes, we may not be able to visit all of the above NGOs. If there is one in particular that you are interested in, please let us know prior to travel. Click here for a full list of our NGO network and partners. This is the first time I've done a cycling holiday. With an off the beaten track route, excellent leading with a great group of fellow cyclists, what more could one ask for? Additionally two NGO visits helped us to understand some of the social challenges facing this beautiful country. Hoem and So were excellent guiding us through the city traffic, and helpful throughout. thank you. I would recommend this for anyone travelling as a single. Meeting so many wonderful people from around the globe and sharing this epic cycling journey together was awesome. The cycling was a challenge and an incredible adventure from beginning to end which far exceeded my expectation! Hats off to Brett for his skilled leadership, his encouragement and support throughout; nothing was ever a problem or too much trouble! Looking forward to my next Social Cycles adventure. Overall outstanding trip! Cycling route, length, pace, and variety was perfect for the length of tour. The people were great, and while some of this is random, I believe that you Brett, set a tone and culture that helped the group meld nicely. Your day to day organization was also good, which engendered confidence and allowed me to just relax, ride and enjoy. Having Cambodian guides/driver/mechanic is also key to a great experience and all these guys were capable , friendly and a huge asset. The FOOD was awesome. your F&B background definitely added to our experience. I particularly liked the family style meals where you would order, as it gave us variety we might not otherwise have, and also reduced the stress and hassle of ordering, splitting bills etc. The NGO and museum visits really did open my eyes to the challenges of this country, and that enhanced the trip immensely. A fantastic tour. It truly was all about the journey, not the destination. Seeing Cambodia and Vietnam at true grassroots level was amazing, with lots of adventures (both spontaneous and planned) Meeting up with the NGOs gave a greater insight and understanding of what we were seeing each day. Brett and his team did a great job. He communicated effectively and quickly, he provided great challenges, always kept us safe, and his passion for helping the communities we were passing through was infectious. It was a definitely a memorable great tour! It was my first tour. Could not have asked for a better experience. It was a great eye opener, a wonderful adventure, with perfect amount of enough down time and a great way to meet new people. Already planning the next trip..
An incredible experience which will last a lifetime! I loved cycling off the beaten track and learning how the local NGOs are working with their communities. This really was a life changing adventure and I now view the world from a different perspective. We arrive and stay in the heart of the cosmopolitan lifestyle that has been thrust on Siem Reap since the country has opened up to the outside world. After we pick you up from the airport and take you to the hotel, take some time to relax or explore the city before we meet for a welcome dinner. Dinner is at one of Siem Reap’s best restaurants, Marum. It’s part of the Friends International social enterprise projects, providing vocational training for marginalized youth. Sunrise is from 4.30am as we hit the bikes for the first time, but it is so worth it. Sunrise over Angkor Wat is a bucket list achievement for good reason. From here we’ll venture on to other, and arguably more impressive, temples in the area for the remainder of the morning. In the early afternoon we’ll have the chance to visit our first NGO of the trip. We will spend time with these incredibly inspirational people that have dedicated their lives to helping others. Hear their stories and understand what the real issues of the country are. We ride out of Siem Reap to the boat port (20km). Travelling across the wetlands and navigating our way around Tonle Sap river is an experience you will never forget. The road soon turns to single track as we get more and more remote. We farewell our support van and venture on into the rural and barren lands of Cambodia. Few villages exist out here, supporting themselves through sustainable fishing methods. After the boat, it’s another 20-30km to Battambang, depending on the river levels. Battambang is great for shopping, with colonial style streets and hidden secrets where bric-a-brac abounds. Dinner is in another social enterprise based restaurant, Jann Bai, that is often hailed as the best dinner in Cambodia! After an early breakfast, we’ll make our way along the dusty red back roads to the nearby local attraction of Banan Temple. We’ll cycle back to the town of Battambang to explore a little more and grab lunch at leisure. We’ll get to the town of Pursat by early afternoon and into our hotel to enjoy the swimming pool and on site massage spa. We’ll get a great experience from an amazing NGO, Sustainable Cambodia. A full presentation by the executives in their office and a tour of their facilities. See the difference the NGO makes first hand. Be inspired by the real difference made by real people. We start cycling 75km out from Phnom Penh, and ride all the way up to the front door of the hotel. The back roads bring in some of the most spectacular scenery as we pass through villages living on Tonle Sap lake. The ride takes in great coffee stops, endless photo opportunities and a couple of ferries. For dinner, it’s a feast of tarantula’s and crickets at the famous Romdeng restaurant, a social enterprise restaurant from the friends International team. We’ll start the day by meeting the incredible people at Friends International and learn about the wonderful work they do within the community. This is a great insight into REAL local everyday issues, from real local everyday heroes. From the office, we venture towards the Russian market and then move to Tuol Sleng, also known as S-21 Genocide Museum. This devastating chapter of the Khmer Rouge and Cambodian history is emotionally challenging but strongly recommended. There is some free time in the afternoon to process your day, whilst we’ll meet again for a local Khmer BBQ dinner. We cycle south of Phnom Penh to Chisaur Mountain Temple in rural Cambodia. It’s not really much of a mountain at 130m and the route is perfectly flat. We casually cycle through remote villages and waterways, via narrow dirt tracks. Chisaur Temple is where we’ll be for lunch as we have plenty of time to explore these ancient ruins which are 200 years older than Angkor Wat. From here, we’ll take the van down to the Cambodian coastal town of Kampot to enjoy the culinary delights on offer. Start the day with an (optional) mammoth Bokor Mountain cycle challenge! It’s 30km to get to the top. The first 10km is flat, then it just keeps on going up, and up, and up! If cycling uphill doesn’t rock your world, we can bring your bike in the van and you can cycle down! If you feel like taking some time off the bike, Kampot is a great town to caffeinate, people watch and relax. In the morning, we’ll visit Chumkriel Language School (no children will be in attendance at the time of visiting). A fantastic NGO and inspirational human being, Mr Suthy has set up a very grass roots local school to give access to education for children of the salt field community. In the afternoon, we’ll partake in a cooking class, teaching us the best of Khmer cuisine! Today we cross over the border into Vietnam, but not before we discover the wonderful province of Kep. Located just before the border, this town is famous for it’s fresh seafood, particularly crab. We’ll spend a couple of hours exploring the famous pepper plantations and salt lakes on the way. Navigating through the back roads, we’ll make our way around the National Park and to the border crossing into Ha Tien Vietnam. From Ha Tien, we’ll jump in the van and head to Rach Gia for a feast of local seafood and Banh Xeo. Can Tho is where the Mekong Delta really comes into it’s own! To get there we cut through the back roads of rice paddy’s and farm land, arriving in the city by late afternoon. The ride finishes about 20km out of the city, but if your legs and daylight permit, there’s an option to continue all the way in. Alternatively, you can jump in the van. With a population of over a million and a thriving tourist trade, Can Tho has a vibrancy about it like none other. Relax and explore this amazing city. For dinner, we’ll pull up a patch of grass at the night market and treat yourself to a degustation of delightful street food! We’ll catch the floating markets for most of the morning. This is no tourist performance, this is real life for the local people where they trade, sell and buy every day. Following that, we’ll visit the noodle factory where you’ll have a chance to make your own noodles and the cocoa farms just before lunch. The rest of the afternoon is yours to relax, get a massage and soak in the culture! We’ll take a day to casually explore the oasis that is the Mekong Delta. From the coconut candy factories of Ben Tre to the canals and floating markets of My Tho, this is a place to relax and unwind. We’ll avoid the hordes of tourists in My Tho by using Ben Tre as a base to explore the region. It’s still a full day cycling from Can Tho and we’ll enjoy getting amongst the maze that is the Mekong Delta. We should get into Ben Tre for 5pm, and relax with a local family in their home (private rooms). You’ll also have the chance to have an impromptu cooking class for great local food! We’ll start early to beat the heat and what we can of the traffic. We’ll head straight to a coconut candy factory (either by van or by bike) to learn more about this local delicacy. Cycling into Saigon for the last cycle day of the tour is an incredible experience. Ho Chi Minh is what the world would look like if cars weren’t invented. With whole lanes and roads dedicated to two wheels, it is the city of the future as the population grows. Cycling the final 15km or so is completely optional, if you’re not comfortable in the traffic. Usually, about half the riders choose to take the van. Our hotel is in the heart of the city, just a short stroll from the Street Food Market for dinner and a live band. We’ll visit our final NGO of the trip in Mekong Plus. With a presence in Cambodia and Vietnam, this grass roots local NGO focus on a hand up, not hand out policy. The social enterprise part of this NGO trains beneficiaries to make quilts, handicrafts and bamboo bicycles. 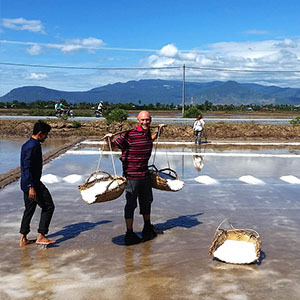 The holistic approach from Mekong Plus includes education scholarships, vocational training, micro finance programs and social enterprise businesses. Use the day to explore at your leisure. There are a feast of local markets, grand shopping centres, museums and attractions in Ho Chi Minh. For the evening we’ll meet up for dinner, swap stories, photos and decide where you’d like the donation money to go to. Congratulations! You’ve cycled across a couple of countries, covered almost 700km in the saddle and more than scratched the surface as to what these fantastic countries are about. We’ll enjoy a final breakfast together before you set off to the airport or your next adventure. We’ll start the day by meeting the incredible people at Friends International and learn about the wonderful work they do within the community. This is a great insight into REAL local everyday issues, from real local everyday heroes. We then venture towards the Russian market and move to Tuol Sleng, also known as S-21 Genocide Museum. This devastating chapter of the Khmer Rouge and Cambodian history is emotionally challenging but strongly recommended. There is some free time in the afternoon to process your day, whilst we’ll meet again for a local Khmer BBQ dinner. You’re welcome to bring your own saddle if you’re slightly nervous about getting a bit sore, or haven’t had the chance to get a lot of saddle time before the ride. Another good option is to bring along a gel seat (cushion). The bikes are fitted with standard pedals. Again, you’re welcome to bring clip ins should you want them. All bikes are fitted with a water cage. Bikes re fully serviced before and after every ride and we’ll have So, our trusty mechanic with us at all times!